For many years, most airlines gave passengers free allowances for their hold baggage, and for hand luggage - usually a single item they want to carry on board the plane cabin. However in recent times many airlines have started to charge for hold luggage and you really can't be sure when you are booking a flight - especially a 'budget' flight - that you are going to be allowed any free baggage at all. Airlines will detail their baggage allowance policies on their websites, in their stores or via travel agents arranging deals for them. If you've bought a ticket online check the information first on the ticket, and if that's not clear, check the information that comes along with the tickets, and your email confirmation - you should find it on one, if not all of those. The amount of baggage you can put in the hold of the aircraft will be determined by either piece allowance or weight allowance. A weight allowance is usually somewhere between 15 to 60kg per person, and can change depending on the type of class you are travelling in - business and first class passengers will usually have more allowance than those travelling in coach/economy. Piece allowances will allow you to have 2 pieces of hold luggage, and it's often worth opting for this type if you can as they usually allow you to carry 32kg per piece (this is subject to their airline, so do check). It's also worth noting that if you are travelling to another country and are travelling on from there, you will need to take their national baggage restrictions into account - It's no use having 32kg suitcases in the hold if the baggage handlers refuse to take them off at the other end. It shouldn't be an issue with connecting flights, as the airline will take this into account when calculating your allowance, but if you are ending one trip and carrying on independently with another airline or from another country then you MUST check this before you pack. For baggage that you want to take on board the cabin with you - or hand luggage, allowances are worked out using weight, maximum size per piece and the number of pieces allowed - usually it's just one per person, though some airlines allow a laptop bag or handbag in addition to this. Again, check before you pack. Although until very recently free baggage allowance was the industry standard, some airlines no longer allow passengers to put any luggage at all in the hold without charging them to do so. This is especially the case with budget airlines, although in order to bring down their carbon footprints, many bigger airlines are allowing one bag per person free of charge, and charging for any more. Charges are usually made per bag, so the cheapest way is to pack lightly. Check whether or not the airline gives you a bigger allowance for chargeable bags – if so you can save money if you pack effectively and don’t take things you’re unlikely to need. You'll find in most cases that airlines will charge for specialist baggage such as golf clubs or a guitar - so factor that into your travel expense if you need to transport a large item. One way to reduce the charges is to pay online - most airlines offer a discount if you pay for your hold luggage allowance before you arrive at the airport. Also bear in mind that if you do a lot of shopping while away, you’re going to need more allowance when you travel back and it’s always worth anticipating the extra bag and paying the online fee than going over the limit and having to pay excess baggage charges. If the baggage you want to check into the hold is more than the allowance you’ve been given, then the airline can charge you an excess baggage charge - and this is as well as any charges you had to pay initially to put your bags in the hold in the first place. The charges for excess baggage are very different depending on the airline you are travelling with. Usually you will find that it works out far more expensive than it would have been to just purchase the extra baggage allowance in the first place, especially on a long-haul flight. If your hand luggage is too big or over the weight limit, they may ask you put it into the hold and this may take your hold luggage above the allowance, causing you to incur excess charges. 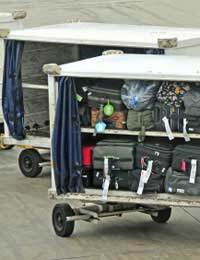 It's up to the discretion of the airline whether or not they charge excess baggage fees. Often they let it go, but don't assume that because you weren't charged on the way out that you won't be charged on the way back or on a different journey - it may be a different plane, or the airport may have a different policy.